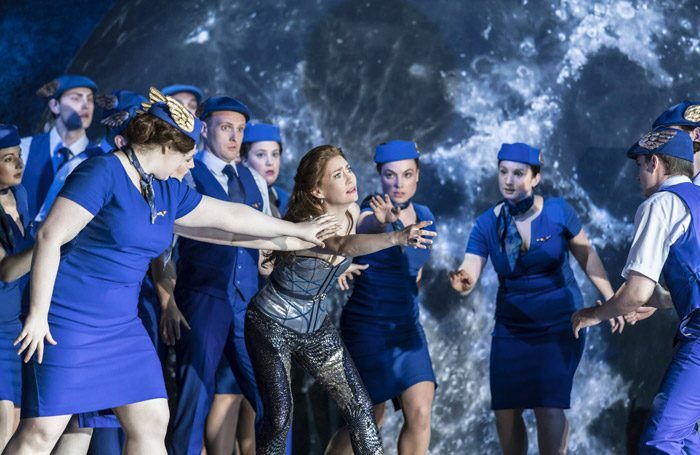 Garsington’s new production of Handel’s Semele, directed by Annilese Miskimmon (soon to join Oslo National Opera as Artistic Director), is something of a triumph. There’s immediate appeal in the charming naivety of Jupiter’s realm as Semele sings Endless Pleasure – complete with cloud-forming balloons and hovering doves-on-sticks, in Juno (god of childbirth) singing from her hospital bed while about to go into labour, and in the semi-comatose Somnus (god of Sleep) making an early appearance to administer pain relief to Juno before, in his first appearance proper, his snug duvet is comically subject to magical manipulation. There are cute children too. Juno’s half a dozen little girls run around periodically, and the climactic birth of Bacchus (son of Semele and the god Jupiter) brings forth a little toddler – aptly the real life-son of Heidi Stober, who sings Semele. Nicky Shaw’s designs include fitted bright-blue flight crew uniforms for the heavenly attendants and an evocative moonlit backdrop. As the sun sets outside Garsington’s airy pavilion theatre, the stage responds with illuminated moons and a candlelit memorial to Semele. But even more effective are the strong characterisations of Semele and Juno (Christine Rice). Far from being reduced to putty by Jupiter’s godliness, Semele is guided by her own desires, and Juno – amid the decidedly mortal bloating and wincing – is a force to be reckoned with. Both sing brilliantly, Stober bright-toned and ever-agile, and Rice luscious and effortlessly resonating. Robert Murray as Jupiter is a commanding presence if vocally less competitive and Jurgita Adamonyte as Ino amply balances comic touches with the interior anguish of admiring Athamas from afar. Under Jonathan Cohen the Garsington Opera Orchestra sparkles and the Chorus makes a strong impression too.